October 30, 2017 - Hurricane Harvey, which decimated parts of South Central Texas and the upper Gulf Coast, caused more than $200 million in crop and livestock losses, according to Texas A&M AgriLife Extension Service economists. “The effects of Hurricane Harvey will linger for quite some time with our Texas farmers and ranchers,” said Dr. Doug Steele, agency director in College Station. “Many South Texas or coastal area cotton farmers were on the verge of harvesting one of the best crops ever in Texas, while some ranchers were unable to save some cattle from insurmountable flood waters. Livestock losses include not only cattle and calves that died during the hurricane but also industry infrastructure, said Dr. David Anderson, AgriLife Extension livestock economist in College Station. Beyond animals lost directly due to the storm, extensive supplies of hay for winter feeding were destroyed. The value of fences, barns and animal-handling facilities lost addsup quickly, Anderson said. 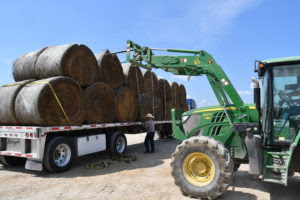 Meanwhile, 200,000 bales of cotton lint on the stalk valued at $62.4 millionwas lost and another 200,000 harvested bales valued at $9.6 million had degraded quality, said Dr. John Robinson, AgriLife Extension cotton marketing economist in College Station. In addition, there were widespread losses of cottonseed. Rice and soybean crop losses accounted for approximately $8 million in losses. In its October crop production estimates, the U.S. Department of Agriculture lowered Texas rice production 614,000 hundredweight compared to pre-storm estimates. The value of that production at current market prices is about $7.5 million, said Dr. Mark Welch, AgriLife Extension grains marketing economist in College Station. The USDA-Farm Service Agency reports 1,729 acres of soybeans have been reported as failed along the Coastal Bend. While specific production numbers are not yet available for counties along the coast, using a statewide average of 37 bushels per acre puts the value of lost soybean acres at just over $500,000, Welch said. He said most of the corn and sorghum crops along the coast were harvested before the storm. 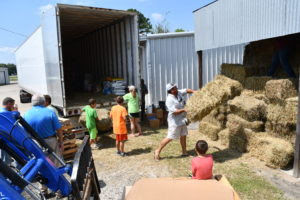 Average corn yields of 124 bushels per acre and sorghum yields of 103 bushels per acre or 5,768 pounds are being reported for District 9, the Upper Coast, both all-time record highs, he said. Dr. Andrew Ropicki, AgriLife Extension economist at Corpus Christi, said multiple industries tied to both commercial and recreational fisheries suffered losses. Ropicki said losses to the commercial oyster industry are expected to be severe due to decreased production caused by excessive freshwater in the bays. Since oyster season begins Nov. 1 and runs through April, a complete summary of industry losses won’t be available until late spring, Ropicki said.